Conceptualizing food ahead of time always leads to the best meal. I love a good theme or concept that I can use to inspire a menu. Whether I get it from a cookbook, or a magazine or just daydream about it, it can be magic when you execute the vision for your guests. A friend of mine, whom I met at a breadmaking cooking class was coming over for dinner so I wanted to come up with a theme for the dinner. I love eating Italian food so I thought I could play around with some flavours in the Mediterranean realm. I had some leftover risotto from my previous video post here so I thought about how I could repurpose it. Initially I wanted to do arancini because YUM, but it was going to be too complicated to set up the breading station and I didn’t want my small little one bedroom apartment to smell like oil while a guest was visiting. In the past I have been reluctant to reheat risotto but this time I added a bit of water so it wouldn’t be too gluggy and it worked beautifully, like I had just made it fresh! I topped it off with a little parmiggiano frico and a sage leaf garnish. I think I could have cooked the frico a bit longer because as it sat on top of the mushroom risotto, it got a bit soft from the steam, so maybe I could just serve it standing up so it wouldn’t get soggy! The next course was ridiculous; did I mention I’m humble? No, I don’t mean to toot my own horn but sometimes in the kitchen, and believe me it’s rare as I’m very critical of what I cook, the dish far exceeds your expectations. Well this was one of those occasions. I braised some lamb shanks in wine and veggies (onions, celery and carrots), tomatoes, garlic and herbs. It’s a simple set-up but something happens to meat when it’s braising for hours, especially on the bone. The sauce gets rich and everything comes together. I started by browning the shanks with some olive oil and then added all the veggies to get some colour on them. I braised the shanks for about 2.5 hours and they were perfect. To elevate the presentation, I let them cool a bit and removed the meat. I took all the big chunks out of the sauce and reheated the meat in the sauce. I chose to serve this succulent braised lamb with some polenta (my first time making polenta). Check out the recipe I used here, I highly recommend it, so much flavour! I topped it all off with a fresh parsley gremolata (parsley, garlic and lemon zest), a traditional osso bucco garnish. The dish was creamy and rich. The herbs (rosemary, thyme and parsley) really provided a great fresh aftertaste. I would have been happy to finish there, but of course I had prepared a dessert. I was thinking of some ‘Italian’ flavours and one of the first thing that popped into my head for desserts was Amaretto, sweet almond liqueur. Who doesn’t love a boozy coffee with Amaretto splashed into it? So I married some Aeropress-brewed coffee and Amaretto into my go-to ice cream base recipe here. For a garnish, I made a quick croquante which is basically a dry caramel that you add a knob of butter into, then at the very end you stir in some chopped nuts (I chose to use hazelnuts). You roll it out in between two sheets of parchment paper and while it’s still hot you can cut out fun shapes. 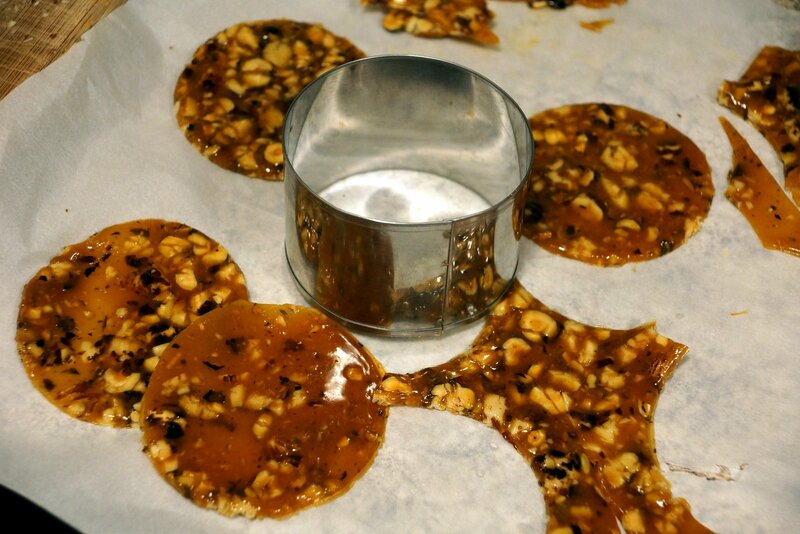 Add a bit of salt to your caramel to bring out the flavour of the nuts more. And there you have it folks, an Italian dinner/recipe for a food coma! I’d love to hear what Italian flavours you like yourselves! ?